Summer tomato season is heading our way. I don’t have a huge garden plot to grow produce in, but I always grow tomatoes as there is nothing finer on this earth than a homegrown organic tomato. Come August, we’re usually over-run with them, and are eating them in everything. And really, there’s nothing better than a fruit so delicious that you can slice it, grate a bit of fresh black pepper on it and eat it with a fork. As luck would have it the night I made this, a gorgeous sunny day had turned dark and cloudy, with storms brewing, so this photo is nowhere near as bright and summery as this salad’s true appeal. Fresh chopped tomato and peppers, doused with a liberal amount of oil, a splash of good vinegar and a veritable shower of fresh parsley, basil and thyme and the taste that springs from your fork is all about Summer! Summer! Summer! Even when Spring! struggles to fully arrive here in Minnesota. So imagine it yourself; the taste of a ripe juicy tomato, the crunch of seasoned and browned cubes of hearty bread, toasted to a firm crunch, the snap of bell pepper and the heady flavor of fresh herbs. Mix in pieces of perfectly cooked shrimp, doused with a bit of chili garlic sauce for spice, served over fresh spring greens and you’ve got a dinner salad with substance, not to mention a wild ride of textures, flavors and colors. I could have admired it in my bowl if I wasn’t so hungry. And simple? This here’s an easy, quick dinner to have ready. With a few shortcuts like artisan croutons and cooked shrimp, you can get this together in about 15 minutes, yet it’s hearty enough to fill you up, but not leave you sluggish. It may even give you an extra burst of energy to head out after dinner for a gorgeous sunset walk. 4 c. multi-grain bread cubes, preferably day old. Or equivalent of pre-made croutons. If using fresh bread cubes, preheat oven to 350°. Place bread cubes in a large bowl and drizzle with 2-4 T. olive oil. Toss to coat and spread on a baking sheet. Bake the cubes, stirring every 5 minutes or so until they’re very crisp and dried, about 15-20 minutes. Watch them carefully. Allow them to cool completely before assembling the salad. 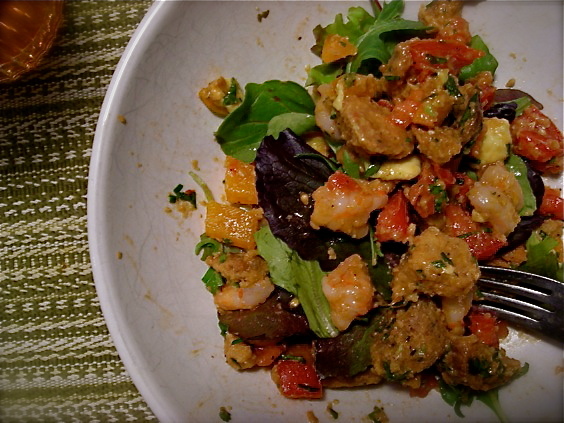 Combine the shrimp, tomato, bell pepper, fresh herbs, olives, brine and vinegar in a large bowl. Drizzle with 3-4 T. olive oil and toss to coat. Add cooled bread cubes, toss to combine. Season to taste with salt and pepper. Allow to sit for 15 minutes to mix flavors. Nice! I love the addition of shrimp. 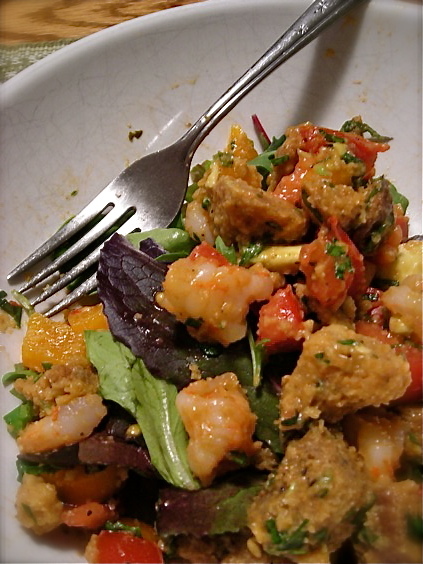 I always do my panzanella vegetarian, but shrimp is a great idea!